The Arizona Department of Education (ADE) is pleased to announce that both its Every Student Succeeds Act (ESSA) survey and ESSA FAQ and Comment Form are now available in Spanish atwww.azed.gov/essa/encuesta/. We are asking for your help sharing these new resources with members of your community who would be interested in providing their input so that we can ensure our ESSA state plan truly represents all Arizonans. 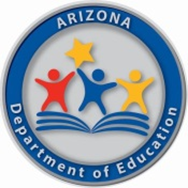 ADE is currently seeking general comments regarding ESSA and the transition process, which will be used through the end of September to help draft Arizona's state plan for ESSA. The English version of the survey is availableatwww.azed.gov/essa/survey/while the dedicated ESSA home page contains links to additional ESSA resourcesand gives stakeholders an opportunity to share their thoughts on proposed ESSA rule making. The site will be updated frequently with information on stakeholder engagement opportunities and examples of comments as they are gathered. To view the comments ADE has already received, please visitwww.azed.gov/essa/responses/. Feedback also can be submitted via email atESSAInbox@azed.govand all Arizonans are invited to join the conversation on Facebook or Twitter using the hashtag #ESSAinAZ. Interested stakeholders will have additional opportunities to share their thoughts on ESSA with Superintendent Douglas at any of her upcoming We Are Listening Tour events, which continue in Page on September 20 and on the Hopi reservation in Kykotsmovi on September 21. More stops are planned through the fall and a full schedule is available atwww.azed.gov/weheardyou. The Department is working with local communities in each area to provide appropriate interpretation services at each event. Our top priority is to ensure all Arizona children have access to an excellent education so that they can achieve their goals and be successful citizens. We thank you for your partnership in that effort and look forward to working with you to develop a state plan for ESSA that strengthens our education system.